Not to be confused with Kampala–Jinja Expressway. The Kampala–Jinja Highway is a road in Uganda, connecting the cities of Kampala and Jinja. Sometimes referred to as Kampala–Jinja Road, it is a busy road, with several towns, trading centers and other points of interest along the way. As of October 2016, a new, wider, four-lane dual carriageway expressway, the Kampala–Jinja Expressway, is proposed to be constructed south of the present highway to relieve traffic and complement existing transport infrastructure between Kampala and Jinja. 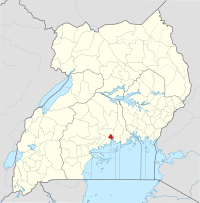 The highway stretches from Kampala, Uganda's capital and largest city, to Jinja, the country's second largest commercial center, a distance of approximately 80 kilometres (50 mi). The coodinates of this highway near the town of Lugazi are:0°22'27.0"N, 32°54'56.0"E (Latitude:0.374175; Longitude:32.915550). The highway is an all-weather tarmac single carriageway road in good condition. The highway forms a section of the Northern Corridor, a road system that connects the East African cities of Bujumbura, in Burundi, Kigali, in Rwanda and Kampala, in Uganda to Nairobi, in Kenya and ultimately to the Kenyan port of Mombasa. The road is a vital commercial link to the outside world for the three land-locked countries. It is also a vital road link to the sea, for many parts of eastern Democratic Republic of the Congo. The following points of interest lie along or near the Kampala–Jinja Highway: (1) Uganda Management Institute; in the Central Division of Kampala. (2) Makerere University Business School; which is located in Nakawa, Kampala. (3) Kyambogo University; in Kyambogo, Kampala. (4) Banda Hill; this is hill on which Kyambogo University is located. The name also refers to the residential and commercial neighborhoods on and around that hill. (5) Kireka; is a township located in Kira Municipality. (6) Bweyogerere; is another township in Kira Municipality. (7) Mandela National Stadium; is the largest sports stadium in Uganda, with a seating capacity of 45,202. (8) Namilyango College; is an all-boys boarding high school which is located bout 4 kilometres (2 mi), south of the highway, at Seeta in Mukono Town. (9) Mukono Town; is the point where the Mukono–Kayunga–Njeru Road and the Mukono–Kyetume–Katosi–Nyenga Road branch off the Kampala–Jinja Highway. Both reconnect to it at Njeru, 55 kilometres (34 mi) east of Mukono. (10) Sezibwa Falls; which are located approximately 1.5 kilometres (0.93 mi), south of the Highway at Kayanja, in Mukono District. (11) Mount St Mary's College Namagunga; an all-girls boarding secondary school at Namagunga, Buikwe District. (12). Lugazi Town; located in Buikwe District, it is the headquarters of Sugar Corporation of Uganda Limited. (13) University of Military Science and Technology; in Lugazi, is an institution of the Uganda People's Defence Force. (14) Mabira Forest; is a natural tropical rain forest in Central Uganda. The highway passes through the forest for over 30 kilometres (19 mi) between Lugazi and Njeru. (15) Njeru Town; is the largest town in Buikwe District. (16) Nalubaale Power Station; Uganda's oldest public hydropower station was commissioned in 1954. The highway passes over the dam. (17) Kiira Power Station; was commissioned in 2003. The highway passes within 2 kilometres (1.2 mi) of the dam and hydropower plant. (18) Nile Breweries Limited; is a subsidiary of Anheuser-Busch InBev. The highway passes next to the factory at Njeru. (19) The Source of the Nile lies approximately 3.6 kilometres (2.2 mi) south of the highway at Njeru. ^ Observer Media Limited (14 March 2014). "UNRA: Construction of the Kampala–Jinja Expressway". The Observer (Uganda). Kampala. Retrieved 22 October 2016. ^ Globefeed.com (22 October 2016). "Distance between Kampala Capital City Authority Head Quarters, Sir Apollo Kaggwa Road, Kampala, Uganda and Jinja Town Hall, Gokhale Road, Jinja, Uganda". Globefeed.com. Retrieved 22 October 2016. ^ Google (22 October 2016). "Location of Kampala–Jinja Highway West of Lugazi, Uganda" (Map). Google Maps. Google. Retrieved 22 October 2016. ^ PIDA (22 September 2014). "Programme for Infrastructure Development in Africa: Kampala–Jinja Road". Programme for Infrastructure Development in Africa (PIDA). Retrieved 22 October 2016. ^ Google (22 October 2016). "Location of Uganda Management Institute, Kololo Hill, Kampala" (Map). Google Maps. Google. Retrieved 22 October 2016. ^ Google (22 October 2016). "Location of Makerere University Business School" (Map). Google Maps. Google. Retrieved 22 October 2016. ^ Google (22 October 2016). "Location of Kyambogo University In Relation to Jinja Road" (Map). Google Maps. Google. Retrieved 22 October 2016. ^ Google (22 October 2016). "Map Showing the boundaries of the Neighborhood of Banda" (Map). Google Maps. Google. Retrieved 22 October 2016. ^ Stadiumdb.com (22 October 2016). "Nelson Mandela National Stadium (Namboole)". Stadiumdb.com. Retrieved 22 October 2016. ^ Globefeed.com (22 October 2016). "Distance between Seeta, Central Region, Uganda and Namilyango College School, Namilyango, Central Region, Uganda". Globefeed.com. Retrieved 22 October 2016. ^ Globefeed.com (22 October 2016). "Distance between Mukono, Central Region, Uganda and Njeru Mosque, Buikwe, Central Region, Uganda". Globefeed.com. Retrieved 22 October 2016. ^ Google (22 October 2016). "Location of Sugar Corporation of Uganda Ltd's Offices, Factories and Sugar Plantation" (Map). Google Maps. Google. Retrieved 22 October 2016. ^ Obore, Chris (26 May 2010). "Ministry of Defence in talks to buy Lugazi University". Daily Monitor. Kampala. Retrieved 22 October 2016. ^ Kasita, Ibrahim (3 February 2012). "Owen falls dam: Powering Uganda for five decades". New Vision. Kampala. Retrieved 22 October 2016. ^ Globefeed.com (22 October 2016). "Distance between Njeru Mosque, Buikwe, Central Region, Uganda and Source of the Nile, Jinja Municipality, Eastern Region, Uganda". Globefeed.com. Retrieved 22 October 2016. This page was last edited on 21 March 2017, at 01:00 (UTC).